Marriage is a hot topic these days. It's easy to find out who married who and for how long-just turn on the TV or open a newspaper. But with the recent, well-publicized court battles regarding marriage, many are beginning to wonder: Is the increased interest in marriage issues a good thing? Or are people being trained to devalue this sacred relationship? 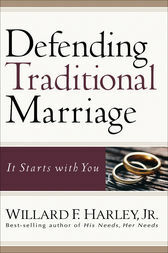 Using expertise from his thirty years as a clinical psychologist and marriage counselor, Willard F. Harley Jr. asseses the state of marriage today and shows couples how to safeguard their own marriages from current laws and culture. In this new book he offers a detailed definition of marriage: it is a permanent and sexually exclusive relationship of extraordinary care between one man and one woman. In thoroughly examining each element of this definition, Harley shows couples what they can do to influence legislation and how to grow a strong marriage-even amidst today's marriage-unfriendly culture.